This Christmas we are driving all the way through Europe from England to Poland. I was planning this trip the other day but yesterday I came to the “Agile Estimation and Planning” presentation by @agilekev. Kevin used the car journey analogy for how we should plan Agile projects – I really liked this idea so I nicked it to apply it here. According to google maps this is a journey of about 1,200 miles. Given speed limits on the way and average driving conditions google estimates this journey should take just over 19 hours. This works out to give an average speed of about 63 mph. Could I get across Europe in 19 hours? I don’t really think so. This ideal estimate does not take into consideration any brakes, fatigue, traffic jams, bad weather conditions etc… I have actually made this journey in the past and it usually takes about two days. So, based on my previous iterations I have an estimated velocity of about 600 miles a day. This looks much more realistic. 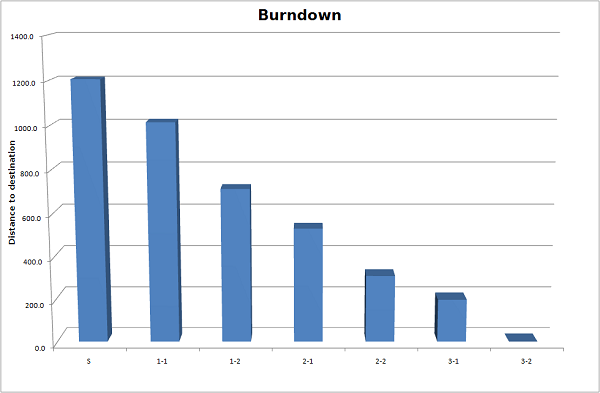 I will try to use my GPS and log the trip so look for the actual burndown chart of the trip in the New Year.